That is a genious idea! I have been looking for a little table or picnic table thing forever an don't wanna spend a lot. Good work!!! LOVE it!! I found this huge, framed ugly picture on the side of the road (ok I realize this makes me sound like a homeless little scrounger) :) but anyway, I took it b/c I had visions of something crafty . . . this post totally inspired me to paint the frame (its currently Gold), toss the pic and glass and make it a chalkboard for Gray's room! So thank you SO SO much!! Beautifully done! What a good eye! I too have forever been on the hunt for a little table for the kiddos. I love it! I hope you don't mind...I pinned your post. I hope all is well! Wish we were closer...we are over due for some family pics. If we are going to replace our pics, they have to be just as good. You are so talented! I loved it. 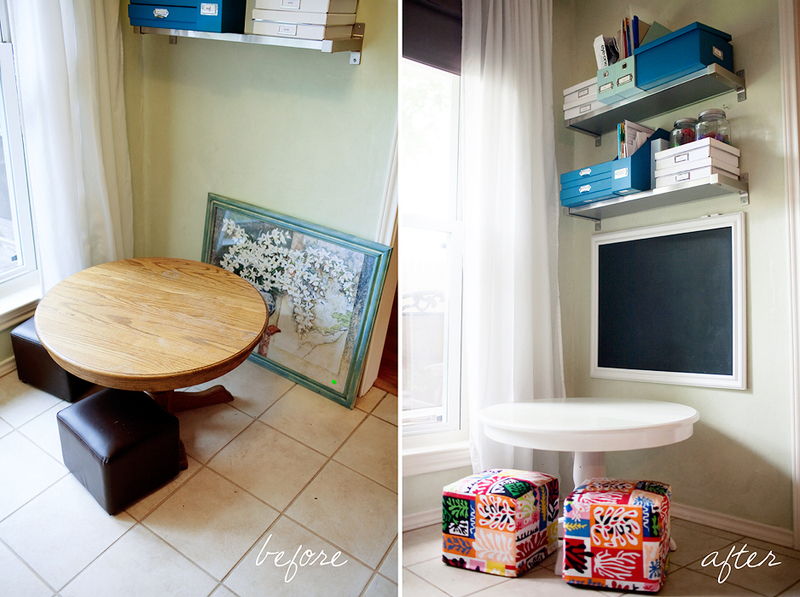 Extreme makeover without the extreme price label.